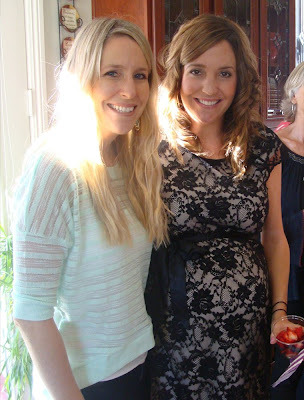 The first weekend was the shower from my sister, sister-in-law, and my mom. The extra special part was that my sister flew all the way from Virginia to have this shower for me. To say that I’m thankful for my sister would be an understatement; we are blessed with a super amazing, hard to explain in words, blessed by the Lord relationship. I felt so special that she would throw a shower for me living so far away! One thing that I just loved about that shower was that she took some time to pause and reflect on the Lord’s goodness. She told God’s story, our unique story-through her lens-and it was so amazing to be reminded of how intimately she and so many others have been involved in our journey. Specifically, how many people have prayed alongside of us for a child. Many of you have cried with us, cried for us, prayed with us, prayed for us, encouraged us, loved on us, and now are rejoicing with us for this baby girl. And all that has only only been possible because the Lord has shown us the value of letting people in-of sharing life with others. As as we have shared our life, our story, and our journey over the last four years, He has provided so many people who have personally and intimately been involved in God’s amazing story…the story of how now is His perfect timing for us to have a baby of our own, after waiting four years. And we don’t believe His story and us having children is done either, as many of you have prayed with us for adoption. We continue to seek Him and His perfect timing for that, and we are just taking this one baby at a time…! Here are some highlights from the first weekend of festivities!! This shower was at Cathy Swanson’s house(my sister’s mother-in-law).. but also a dear friend who also has been praying for us, loving on me and encouraging me over the years. She has such a generous and tender heart, I’m so thankful for her! The spread of amazing food! This was a creative way to have presents at the shower!! Since we live far away, I took pictures of baby things in the town we live in, Leon, and then my sister blew them up and hung them on a line. Then our guests were asked to bring money, instead of bulkier items, and they attached it to the gifts they wanted to contribute to! It was such a creative and thoughtful way to give!! And was perfect since there is no easy way to get stuff to Nicaragua-and I was only able to bring checked bags back! It was different for sure, but so fun and we are so thankful for people who gave money for those much needed larger items!! Oh how I love these ladies! Old old friends-the friend in the cream shirt in the middle is Julie and we have known each other since we were 2yrs old!! That is her mom on the far left, Suzie. And my mom-far right- had the biggest smile on her face the entire day, what a joy to see her so excited about her grand baby! I am so thankful for her prayers over the years, and her joy and excitement that this day has finally come! Sweet friends Kelly & Darcy! My aunt Linda and my cousin Scott’s girlfriend Gea….Crazy thing… She and my cousin Scott are moving to Nicaragua!! And they are only going to be about an hour away!! How exciting to think of having family so close by!! Oh I can’t wait-they are scheduled to be there in June or so! I couldn’t wipe that look off my face-this is my dear cousin Elizabeth, who just had her baby born, Finnley! He was only a week old here! She made the two hour drive with him, I couldn’t believe it! That is some serious love right there. And it was so fun to meet him, they will only be about a month apart!! Yay ! Dejah and her sweet baby girl Nayeli. What a treat to see her too, she was so much bigger from the last time I saw her!! I got some amazing gifts, and this one was pretty special too. My aunt Karen MADE this quilt. That’s right. Even made those little birdies (our theme for her room) by hand. Some birdies were creepy looking and we found these little puff balls, and she actually traced and made them, she is so talented!! And she also made her the sweet bumper pad with ruffles all along it (photos of that to come later). It is amazing, I just stare at it in her room-I just LOVE it. My beautiful sister. Words cannot express how thankful I am for her, and lovely shower she threw for us!! Previous Previous post: Baby showers!! 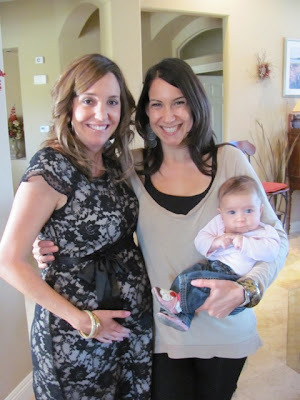 Next Next post: Baby showers-take two!